Ever since Steve Wozniak filed Apple’s first patent back in 1977, the company has been increasing its yearly patent output immensely: while only 19 patents were published during the first decade of the company’s existence, nowadays about 100-200 patents are published each month, with over 1,800 published patents during the first ten months of 2014 alone. Analyzing the connectivity between Apple’s patents and inventors over the years allows to answer a wide variety of questions: for instance, how did technology and knowledge clusters evolve within Apple? From which moment onward did Steve Jobs start playing a pivotal role in connecting Apple divisions? How did the company’s industrial design team (also see here) initially form, and how are they connected to other parts of the company? Let’s turn to network analytics to get a view on this. The visualisation above shows that Apple’s full technology portfolio is composed of clearly identifiable clusters of inventors and related technologies. The top part of the light blue cluster at the left consists of Apple’s industrial design team, led by Jony Ive – the bottom part is mainly composed of patents and inventors relating to mobile device components. Steve Jobs served as the key connector between the left and right parts of the network, by connecting the dark blue cluster at the right (which consists of all things related to user interfaces and operating systems) to the design and mobile devices cluster. The red cluster at the right is largely focused on iTunes, while the small purple cluster on the far right is composed of Apple’s experts and patents in data encryption and security. Although interesting conclusions can be drawn from ‘static’ networks based on fixed time periods such as the above, dynamic network analysis spanning multiple time periods can provide a whole new perspective on the actual formation and decline of (sub-)networks. Let’s start dissecting the above network based on various time periods to get a sneak peek into Apple’s technology history. The networks in this post are based on all Apple patents published between January 1978 and October 2014. To avoid duplicate entries based on applications for the same invention in multiple countries, only representatives of so-called patent families (groups of patents disclosing the same invention in multiple countries) are included. This leads to a total dataset of 9,663 patents listing 5,272 unique inventors over the 36 years analysed. Inventor names were deduplicated using a pattern-matching algorithm – any false negatives and positives were taken care of manually. This was done to avoid e.g. ‘Steve Jobs’ and ‘Stephen P Jobs’ appearing as two separate inventors. Inventors (circles) are connected in the networks whenever they appear as co-inventors on a patent; patents (squares) are connected to inventors whenever an inventor appears on that patent. Colours were assigned to patents and inventors based on the network cluster they reside in – clusters were identified using an algorithm which groups nodes when they are densely connected internally, but sparsely connected to other groups¹. 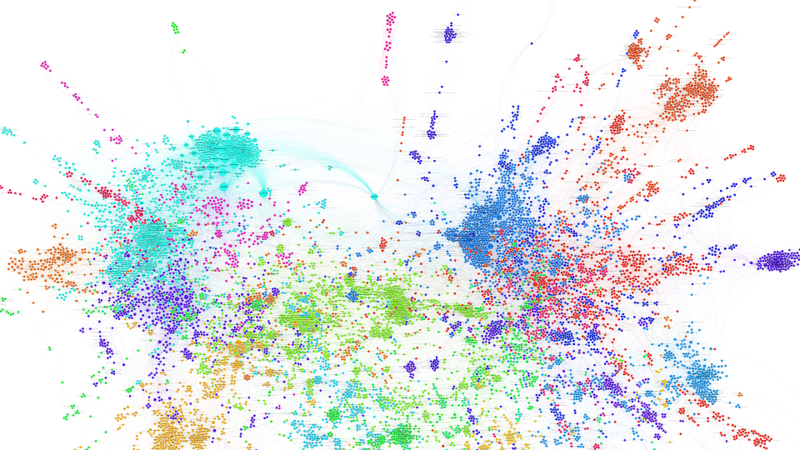 Mapping networks of Apple inventors and patents in subsequent time periods provides the opportunity to visually determine how technology clusters formed and disappeared within the company. Based on key milestones in Apple’s history (product introductions, Jobs’ resignation and return, etc.) and overall patenting activity, networks were constructed for 9 time periods to be able to visually assess the evolution of technology and knowledge clusters. The interactive visualisations below allow you to explore the networks and search for patents and inventors. You can zoom in/out using the mouse wheel or navigation buttons, search for nodes and highlight your search result using the left-hand box, and switch between time periods using the blue buttons. Clicking a node shows its direct connections; nodes are sized based on their number of connections. Colours of technology clusters are kept constant over all time periods to be able to quickly assess how these clusters grew over time. Although Apple’s first patent was filed by Steve Wozniak in 1977, it wasn’t published until early 1979. The patent ‘Microcomputer for use with video display’ actually describes the Apple II, now famous for being the first microcomputer to reach the masses. Rod Holt (shown in the network as Frederick R Holt) also played an important role at this time, being the inventor of the Apple II’s power supply. Another notable inventor is Wendell Sander, who served as the lead developer for the Apple III back in the days. Patenting activity was limited, with only 16 patents published during this period. In 1985, Steve Jobs was forced to leave Apple and founded NeXT – he was nowhere to be found on any patent yet. Apple’s ‘Jobsless’ period marked a significant increase in the number of patents, jumping from a mere 4 published patents in 1986 to 182 patents in 1996, with 675 patents published over the entire time period. Multiple technology clusters started forming here, with key roles for Steve Roskowski (a hardware engineer/CPU lead at Apple back then), Steve Young (responsible for the Powerbook Duo’s architecture, engineering and manufacturing – see here). Jony Ive, Apple’s current SVP of Design, also makes a first appearance during this period, co-authoring patents related to a device enclosure (probably for the flopped Newton PDA?) and a monitor. Early work on the FireWire interface is also visible here, through a cluster led by Florin Oprescu and Roger van Brunt. Apple’s acquisition of NeXT paved the way for Steve Jobs’ return in the company’s management team. He eventually became CEO again and initiated a significant restructuring of Apple’s product line. Going hand in hand with these changes was the formation of Apple’s Industrial Design team, which is clearly starting to form in the network for this time period: Jony Ive is joined by Bart Andre, Daniel de Iuliis, Chris Stringer, Duncan Kerr, Matt Rohrbach, Richard Howarth, Daniel Coster and Eugene Wang, who would all become key members of the Industrial Design team, responsible for the design of many of Apple’s new products. Jobs also makes a first appearance as a patent inventor here, working on user interfaces together with Dutchman Bas Ording. The red cluster in the centre of the network focuses on Operating Systems (conciding with the release of OSX in 2001), pen-based input technologies (related to the Newton PDA, which was eventually discontinued in 1998) and various other technologies. Apple’s network really started shaping up during this period. The network now shows one highly interconnected component², with Steve Jobs occupying a central position right in between the Industrial Design team, the iTunes cluster led by Jeff Robbin (current VP of Consumer Applications), and User Interface/Operating System design with Bas Ording, Greg Christie, Scott Forstall (the to-be iOS lead) and Imran Chandhri. The launch of the iTunes Store in 2003 is clearly reflected in the network through the large red cluster at the right; iPod technologies can be found in the bottom green cluster; the blue cluster at the bottom right shows Final Cut Pro video editing technology. The Industrial Design team also ramped up its output, with a wide variety of designs to be found in their light-blue cluster. Some of the touchscreen technology for the first iPhone (introduced early 2007) is also visible around Steve Jobs’ position. In line with a significant increase in patent output, the inventor/patent network grew to a total of 636 inventors responsible for 940 patents. We see key roles for Greg Christie (then lead of the Human Interface team) and Scott Forstall (the iOS lead) in the blue cluster, showcasing Apple’s focus on bringing iOS to the next level. Interestingly, the Industrial Design team is slightly secluded from the rest of the network, with relatively few connections to other technology clusters. Jobs connects software/interfaces and design once again; and Steve Hotelling (in yellow) is shown as highly important in the development of touch-based technology, as a precursor to the introduction of the iPad in 2010. The network now contains 1150 interconnected inventors responsible for 1276 patents. In line with the introduction of the first two iterations of the iPad during these two years, touch-based technologies play a key role here. The green cluster in the centre is mainly focused on technologies related to iPods, and coincides with the release of the iPod shuffle, iPod Touch and iPod Nano in 2010. The blue cluster at the right seems almost fully focused on video conferencing: FaceTime, Apple’s video chat app, was introduced as a key feature of the iPhone 4 in 2010. In the Industrial Design cluster, we see Bart Andre and Duncan Kerr emerging as key connectors to other clusters. Steve Jobs passed away in October 2011, with Tim Cook becoming the new CEO. The networks from this year onwards are presented based on a one-year period because of a significant surge of patent activity, coinciding with the patent wars between Apple and various other smartphone manufacturers. We see a clear focus on new product designs in the clusters at the bottom left, in line with the introduction of new iterations of the iPad, iPhone and MacBook, as well the introduction of the iPad Mini. Steve Jobs still appears in the network through his work on patents which were published in 2012, for which the work mostly took place in the two preceding years. Dutchman Bas Ording solidifies his position as one of Apple’s key User Interface designers; Steve Hotelling continues work on touch technology; and Thomas Alsina (Manager iOS Media & Apps) emerges as a key person in Jeff Robbins’ cluster. 2013: A split in the network? Something very interesting can be observed here: Apple’s technology network starts splitting up into two distinct sub-clusters. Might this have something to do with Steve Jobs missing as the key connector between Apple divisions? He’s still listed on patents published during this year and (together with Raymond Sepulveda in Human Interfaces) still connects the Design and OS/Human Interfaces teams, but the interconnections are far less dense. The left part of the network is mostly composed of designs, touch and display technologies; the right part focuses on software in the broadest sense of the word. Hardware versus Software: is Apple becoming a more silo’ed company after Jobs passed away? A new dark orange cluster also emerges here, focusing on mobile network technologies. This is in line with the release of the iPhone 5, which included 4G support. 2014: Design as a priority – reduced focus on software? Jony Ive’s team and the designers surrounding them in the clusters at the left have been busy: the network based on patents published from January to October 2014 includes a grand variety of patents and inventors related to product and accessory design, but only shows a relatively limited amount of patents and inventors on the software side. Recent changes in Apple’s iOS and User Interface teams may be one of the key reasons for this: both Bas Ording and Scott Forstall have left the company recently. Of course, these conclusions are just the tip of the iceberg – further analysis and discussion of these networks may provide a wide variety of other interesting insights into the evolution of Apple from a technology and knowledge perspective. One of the main conclusions we can draw here is that Steve Jobs played a pivotal role in connecting Apple divisions: ever since his return as CEO in 1997, he functioned as the hub between the company’s product design and user interface divisions. After his death, a clear distinction between hardware and software R&D activities emerged, showcasing the importance of Jobs in binding the company together. The analysis of network evolution in general provides an opportunity to identify how knowledge and technology clusters within an organisation emerged, formed and declined over time. This can be of great aid in market intelligence or human resource management activities, by providing deeper insight into the actual functioning of Research & Development within a company of interest. Feel free to post any insights you may have in the comments below! ²: The networks from this time period onwards only show the largest interconnected components – to avoid clutter, disconnected nodes and small clusters are not shown. during the period after Jobs died and Scott Forstall left Jony Ive took over UI. This would explain the concentration on the design side away from the software side. However, as you said you can see the fragmentation seems to have accelerated in the last year of your diagram. This brings two questions to me. Is the silo effect only occurring on the patents and Tim Cook is the new hub? In effect he isn’t an inventor, but a facilitator to maintain and grow what Jobs started. Or because Tim Cook isn’t an inventor and the creative binder that Jobs actually provided is essential to integrated design that makes and maybe made Apple’s products so great. So is apple now on fragmented track until a new inventor fills that void? i do not get it, – who is “inventor” here? Jobs? The real Inventor (Wozniak) left long time ago…. I used to try to teach a related concept to the IP guys at the federal labs (where lots of fascinating and potentially useful technology is developed but where little is actually “used” and of which remarkably little actually gets licensed): if you want to sell a technology that your lab has developed, write the patent strategically: start by looking at the IP portfolios of the target companies (the companies you think ought to license your tech), and look at their key competitors. Look closely at acquisition patterns in their libraries, and look at their competitors’ libraries. Make a map. Stake out territory that defines as much of the gap between some territory they have claimed and the boundaries of what their competitors have claimed.